« A Knighthood for Ozzy? “Escape” by Journey is probably one of the best known albums of 1981. I remember in the final months of that year, there always seemed to be a song from the album playing on the radio, whether it was “Who’s Crying Now,” “Open Arms” or the now very popular thanks to the TV show “Glee,” “Don’t Stop Believing.” It is also the reason that many people site this album as the turning point in Journey’s sound from their more traditional progressive hard rock sound towards the more commercial sound of their next album “Frontiers.” Either way, it was a very important album in 1981 in many ways for a lot of people, including me. Looking beyond “Don’t Stop Believing” which is still a good song in spite of how it has been used recently. The piano intro by Jonathan Cain is still very unique and even though it is a top forty tune, Neil Schon still hammers out a decent guitar solo. Similar things can be said about the second single on the album, “Who’s Crying Now,” which comes right after track number two “Stone In Love.” I wonder if that song was written for one my fellow metal bloggers here, tee hee. Anyway, back to “Who’s Crying Now.” There is a mysterious vibe to the song and it ends with some more fantastic guitar work from Schon. 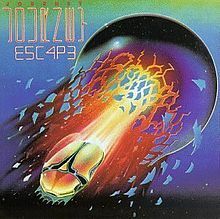 That leads perfectly to the harder sounding “Keep On Running” and hearing that, the listener can be assured that Journey have not departed from their hard rock roots. The title track bears some great progressive sounds and the next few songs feed well off it. Then another rocker, “Mother, Father” and more impressive Schon guitar licks before the closer, “Open Arms.” I liked that song back then but it holds a more special meaning for me these days. It was mine and Mrs 80smetalman’s first dance song at our wedding. I must make a confession here. The first dance song wasn’t taken from the “Escape” album but from a soundtrack to a 1981 film, which I will be visiting down the line. Still, it goes to show just how big this album was in the year. This entry was posted on May 11, 2014 at 6:59 pm and is filed under 1980s, Heavy Metal, Music, Rock, soundtracks, Uncategorized with tags Classic Rock, Escape, Frontiers, hard rock, Heavy Rock, Journey, metalodyssey, Neil Schon, progressive rock, television, The 1980s. You can follow any responses to this entry through the RSS 2.0 feed. You can leave a response, or trackback from your own site. I’ve had this one for years, didn’t like it very much when I first got it apart from the megahits but it really has grown on me. Damn fine choice for a first song too! Thank you, it did the trick. I was in the same vein about this album as you were before I sat down and listened to it properly. I love this album. Don’t think there’s a bad song on it… Although it is pretty hard to listen to Don’t Stop Believin’ now as it’s been so overplayed. I’m kind of sick of hearing it now! I hate it when that happens. I know what you mean about “Don’t Stop Believing.” I hate it when they over commercialise great songs. It’s one of the reasons I avoid radio. So many Rock classics just get over played. Enter Sandman was one I got totally sick of hearing. Me too. I think that radio stations honestly think that they are doing the rock/metal community a major service by playing these songs to death when in fact, it has the opposite effect. I half want to buy that boxset of the first five Journey albums, but then Glee happened and Rock Of Ages happened and it sort of made me want to wait until later, when that song isn’t on the radio every five minutes. And I was already a bit oversick of it after Scrubs and Family Guy both made it popular again. Seems like every so often, somebody keeps re-igniting it for the radio stations. And that is why I rarely listen to radio any more. A good way to kill a great rock song is for the radio stations to play it to death. Good point then again, many good tunes have that effect on me. For me the underrated classic (and my favorite track) on the album is “Mother, Father.” The lyrics, the message, and all the players are in fine form. It’s just compelling from beginning to end. I don’t know if you guys have heard the stuff on Dream After Dream, but “Mother, Father” just sounds like a natural progression from the songs on that album. Now you got me intrigued, I’m going to have to listen to those again. I read that they wanted to call it Stoned in Love but had a change of heart for obvious reasons. Great post, GREAT album, probably my favourite one. Yes even in 1981, the anti- drugs campaign by Nancy Regan was already starting to take form. Still, it would have been an amusing title. Then again, maybe the song was about our metal buddy.